These are the things that build our character and alter our mindset, stilling passion, pride, distress and selfishness. They are outwardly--and to others--perhaps less dramatic. But these kinds of "mind changes" are what I want to give emphasis to. There have been times when temptations tossed me stronger than a wild bull with horns imbedded and God would blow cool winds of peace on me. There have been times when illness and deep distress would have me literally clutching at sanity and God's gracious promise could be claimed--"I have not come to give you a spirit of timidity but of love, power and a sound mind." There were often times when selfishness was a natural bent, when I was right and "they were wrong"--and God would help me swallow my pride and let it go. This could also be at times when I was definitely in the right and had been severely wronged, and forgiveness was something impossible but God gave me that ability to forgive the unforgivable and have peace once again. Having said this, there are several more dramatic "faith-building" experiences I will never forget. Here is one such remarkable "coincidence." 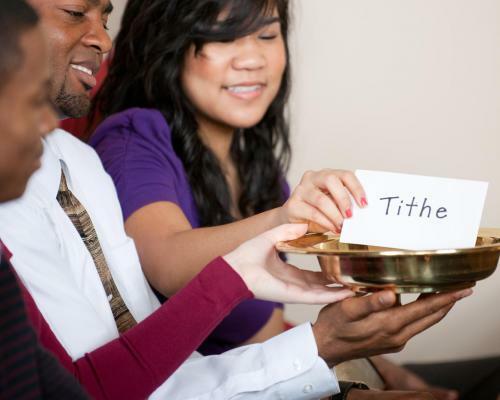 At one stage in our lives, my husband was struggling with tithepaying. He would pay it to at least three different churches at times--pay it, then not pay it, as his faith struggled. We were out for an early morning walk and I was struggling to explain to him that it was for our own benefit that we pay tithe. He had some pretty troubling financial problems at that time. But, I urged, paying tithe is a vast opportunity for us to be blessed by God. God could get money if He needed it but He shows us that by giving, we gain and quoted the promise that God "will open the windows of heaven." Not convinced, he asked me, "What? God is just going to drop money from the skies?" And the very next step--the very next step--there was a $20 note! I love God. I look back at these things and know I deserve none of them. I have failed too often--but He hasn't failed. He is faithful and He moves my heart. How different my life would have been if I had not had my Saviour holding my hand. He graciously gives and keeps on giving to the undeserving, so that we will "hunger and thirst over righteousness" in response to His goodness. For God has not given us a spirit of fear and timidity, but of power, love, and self-discipline. 2 Timothy 1:7.